The latest Windows Server 2019 seeing huge customer adoption helped us understand the growing need for extending support for it with Vembu BDR Suite. As a quick recap from one of our articles written by Virtualization Architect Brandon Lee, you can get to know the major features that were announced during the Windows Server 2019 official release. Let’s have a quick walkthrough on some of the best features that will benefit your Hyperconvergence, Container, the Application Platforms and functionalities that could improvise security vulnerabilities. Those organizations that consider a software-defined scalable platform while scaling their environment can actually capitalize on this capability. Microsoft has clearly understood the potential of this growing billion dollar market and leveraged support for this platform. It is ensured that the fundamentals of HCI- compute, storage and networking are improved to a great extent helping ITs scale their software-defined data centers with Windows 2019. Microsoft has “baked in” hybrid cloud functionality into Windows Server 2019. If you are an IT admin and you happen to manage both on-prem and Azure Windows server deployments, now it is easier to manage both the deployments via the hybrid approach built through interfaces connecting Windows Server 2019 & Windows Admin Center. This allows making use of cloud services directly from the on-premise enterprise datacenters itself. Thus, there is no doubt that Microsoft’s journey to the cloud came out as a well-executed decision that’s worth noting. You definitely would not have imagined Microsoft and Linux on the same page! If Windows Server 2016 was open to extending support to Linux instances as VMs- Windows Server 2019 goes one level further to providing integration for native filesystem storage, networking & security options. Besides, the support for shielded VMs that was once limited to Windows is now extended to Linux as well. Security still continues to be the top priority and Windows Server 2019 is no exception. Alright, now let’s get to understand how Vembu BDR Suite can help you with protecting Windows Server 2019 workloads. If you happen to run a Windows Server 2019 machine on any of production/Remote office/Branch Office workloads, you can go forward with deploying the Vembu BDR Server and the Vembu OffsiteDR server on both of the workloads to protect your virtual (VMware & Hyper-V) and physical environments. Check out the prerequisites here. Configure agentless Windows Server 2019 backups with in-built application-aware processing for MS applications like SQL, SharePoint, AD, and Exchange. You will be surprised to find that there are multiple recovery options that will help you meet your server uptime demands during a downtime. No doubt file servers still hold importance in both Small & Enterprise business that there is always a need for a Backup & Disaster Recovery solution for them that addresses data protection and its complexities head-on. Get started to know how you can implement real-time continuous data protection for Windows Server 2019 machines through file backups here. Well, have you got a Windows Server 2019 on your environment? 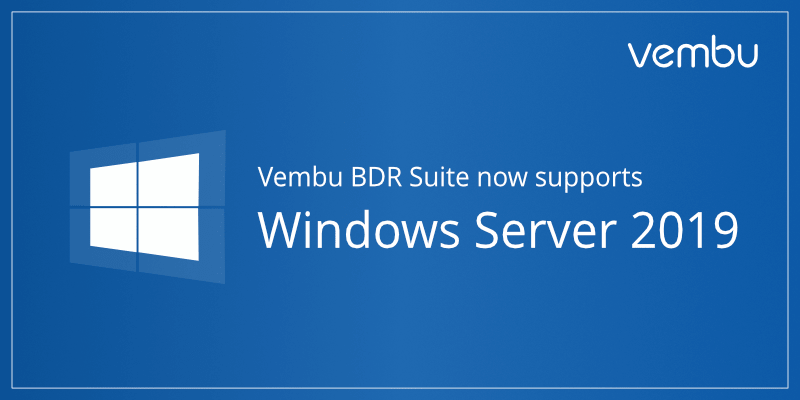 Then, it’s time to download the all new Vembu BDR Suite v4.0 to protect your Windows Server 2019 machines. Got questions? Sign up for a one-on-one technical session with our product experts here. Works for Product Management team. Believes that simplicity is the highest order of intelligence.